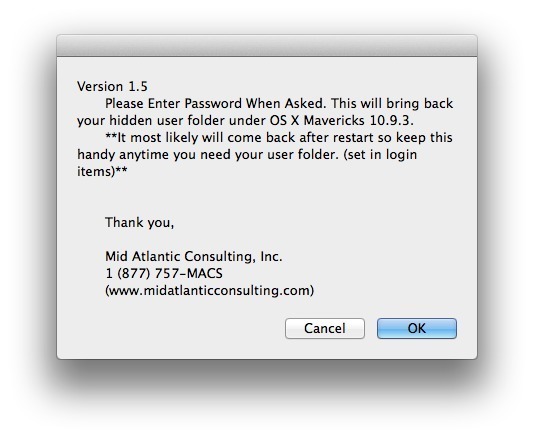 Developer website: Mid Atlantic Consulting, Inc.
Is there a better alternative to UserFolderRestore? Is UserFolderRestore really the best app in System category? Will UserFolderRestore work good on macOS 10.13.4? UserFolderRestore unhides your hidden (invisible) user folder after installing OS X 10.9.3. Note: The user folder may hide again after Restart. Please set this in login items so it auto runs, or just keep it on your desktop so when you need your user folder you can just click on it. There is another method of creating an alias to your user folder which wont go away on restarts, but for security reasons Apple support advises against it.